After her first violin lessons at the Busan Arts high school in South Korea, Jinny Jin came to Germany to study with Professor Jacek Klimkiewicz at the Folkwanghochschule in Duisburg where she received the "Künstlerische Reifeprüfung" in 1997. Later she went to Maastricht and Antwerp where she studied with Professor Dirk Verelst. 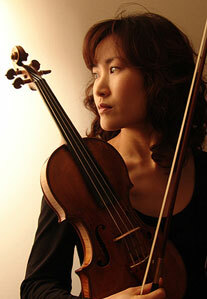 In 2002, Jinny Jin received the Bachelor and Master Degree for violin and Chamber Music. With her piano trio and with different string orchestras she played various concerts and in television recordings in Belgium, Germany, The Netherlands, France, Serbia and the Czech Republic. At present, Jinny Jin is a member of the Love²Arts Ensemble.